If like me you have a little one who you have to keep entertained from morning to night, you will know how important it is to have sensory toys that they can investigate and explore. Although Willow has her fair share of soft toys, when it comes to other toys we pick up for her we always opt for something which is sensory; different textures, different colours, sound and music. Everything helps to aid your baby’s development and toys are something all the family can get stuck in with. A brand we have recently been introduced to is Infantino, which has a huge selection of toys for babies and toddlers that are lots of fun and really sensory orientated. The range includes products which are centred around a particular sensory aspect; such as hearing, reflection, skills, touch and vision, as well as toys which team a few if not all of these together. Of the larger toys on offer, Willow has really been loving her Peek a Boo Ball and Giraffe Playtime Pal, both of which she can sit with and be occupied for a while playing with the different sensory aspects. The Peek a Boo Ball is a fabric ball with each section being different; from different fabric designs to different fabric textures. As well as being a ball that Willow can roll around and play with, it has a hidden monkey inside that she can find and play ‘peek-a-boo’ with. It’s a really decent size and stands out from her other ball themed toys. All of the toys from Infantino which Willow has been enjoying lately are suitable for use from birth, completely safe for babies from the get-go. 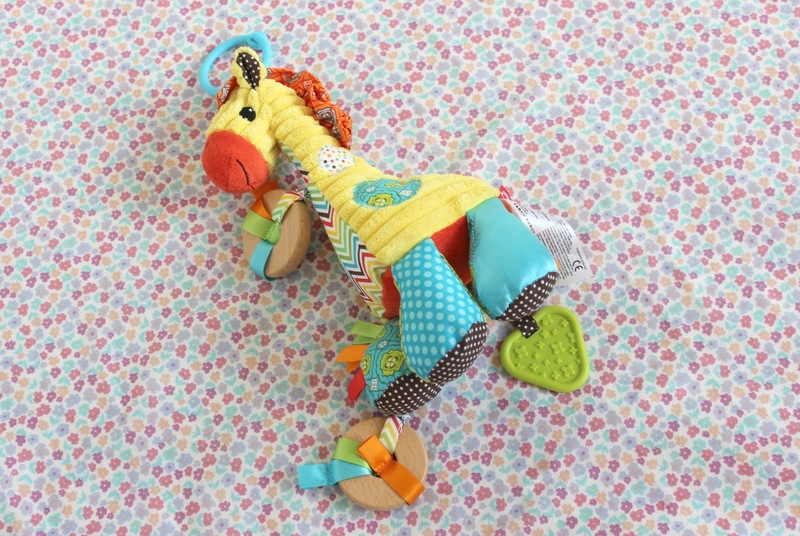 The Giraffe Playtime Pal is one of my favourites, as I adore animal-themed toys, especially as we’re a family that loves watching anything by David Attenborough. This one teams’ playtime with teething, with a combination of textures and sounds, rattles and a natural wooden teether. It also has a handy link which can be attached to your cat seat or pram so can be the perfect way to entertain your little one on-the-go. It’s very decent in size and Willow has taken to having it with her everywhere we go! 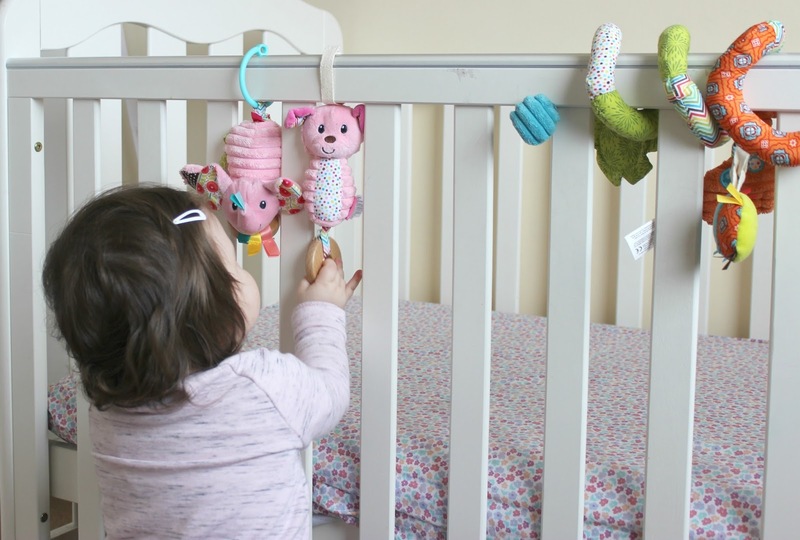 Many toys from the Infantino range are great for on-the-go, being able to attach to bars and straps, and some have lovely subtle sound to them. There’s the Pink Dog Chime, which has a soft chiming sound, as well as the Pink Jittery Elephant which has more of a jingly sound. Both have lots of lovely different textures and fabrics, very bright and colourful, with the added addition of wooden teethers attached. 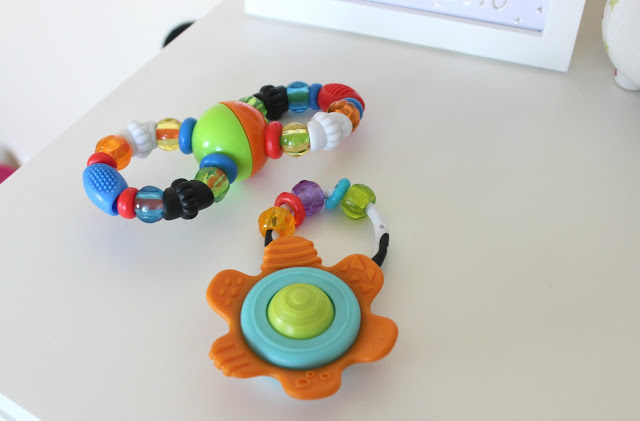 Toys like this are great because they work as a great back-up if you forget your little ones favourite teether at home. Another fab one for on-the-go is the super fun Spiral Car Seat Activity Toy. These are great for popping onto your car seat or the bar of your pram or stroller, a great way to keep your baby occupied when out and about. I’ve spent months hunting down the perfect one for Willow and this offering from Infantino definitely fits the bill. It features a lovely range of fabric designs, making it very colourful and something which Willow can spend time exploring. There’s also four lovely toys attached to the spiral to keep your baby occupied; a natural wooden teether, a textured giraffe, a rattle ball and a flower mirror. Willow is definitely a fan of this one when we’re in the car and it easily keeps her occupied. As well as teething rings added to a lot of toys within the range, Infantino also has a specific range of products specially created to soothe and distract your baby from teething pains. The Squeeze & Teethe Elephant (which I found impossible to photograph because Willow always has it shoved in her mouth! ), is available in both grey and pink, is a soft teether easy for your little one to hold on to, whilst being a fab BPA free natural rubber in texture, so great for gnawing away on. It also has a fun little squeaker inside, which makes Willow squeal with delight every time. We keep this one in our bedroom and she chomps on it first thing in the morning before we go downstairs. 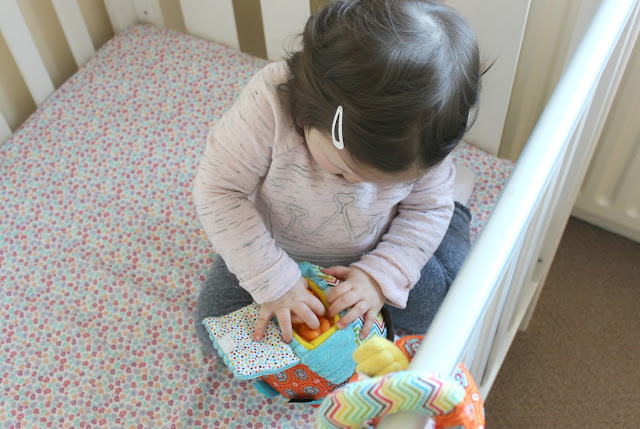 There’s also fun teething products like the Teething Beads which makes sounds and clicks at every twist and turn, whic Willow just simply adores, and has lots of different textures for your teething baby to get stuck into. Like all Infantino toys, it’s colourful and lots of fun, also easy to clean which I think is a really important aspect for teething toys. 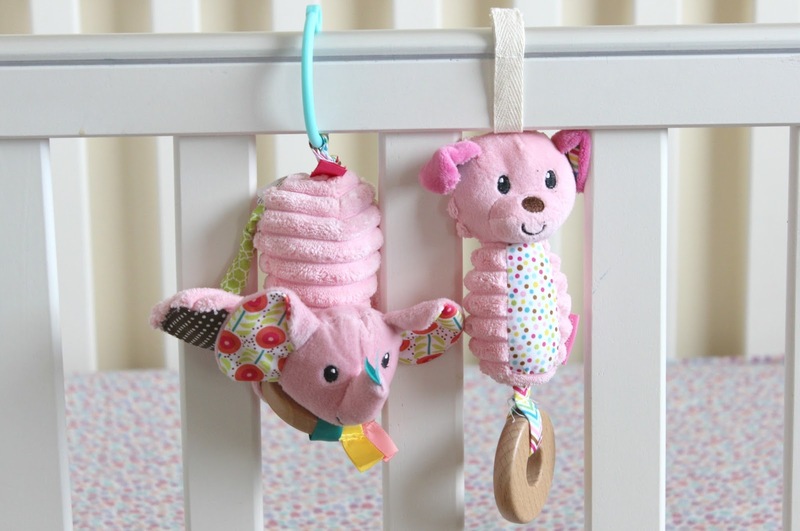 The Elephant and Teething Beads are both suitable from birth, whilst the Shake & Teethe Gummy Flower Rattle is suitable for use from 3 months onwards. Another fabulously textured teether, it’s super sweet and simple; a flower design with a ring and a few little charms to gnaw on. The ball in the centre of the flower spins, which Willow finds funny each time she makes it spin round and round! Willow adores her Infantino toys and they have such a diverse range, there’s bound to be a few that your little one will love just as much. You can check out the full range at www.infantinobaby.eu, available to buy from www.amazon.co.uk.